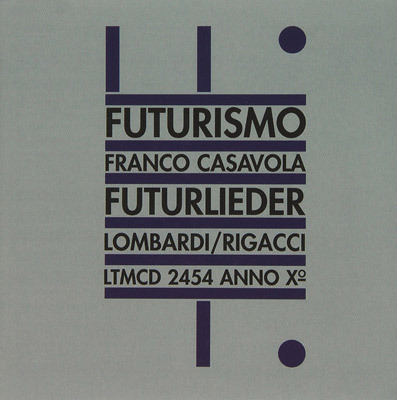 'Futurlieder is an anthology by Italian Futurist composer Franco Casavola. Invited to join the Futurist movement by F.T. Marinetti in 1922, Casavola wrote a number of scores for theatre productions, including the mechanical ballets Anihccam del 3000 and Fantasia Meccanica. He also produced a number of essays and manifestos on future music, and even a Futurist novel, Introduction to Madness. Casavola broke with Futurism in 1927 and afterwards scored only movies. The composer claimed - falsely - to have destroyed all his Futurist scores in 1927. Futurlieder gathers together short pieces such as Dance of the Monkeys (Hop Frog), Zoological Foxtrot, Epileptic Cabaret and Campari, the latter one of the first published advertising jingles. In addition the 66 minute album includes longer song cycles such as Tankas, Liriche, La Sera and Gioielleria Notturna, all of them avowedly Modernist in character, and include settings of lyrics by the poet Gabriele d'Annunzio. All 28 tracks on Futurlieder were recorded by Italian duo Daniele Lombardi (piano) and Susanna Rigacci (soprano) between 1994 and 2004. The set was produced by Carlo Piccardi for Radio Svizzera/Rete-Due, with whom this project is a co-production. "Futurlieder comprises 28 original works by the Italian Futurist composer and theorist Franco Casavola written between 1922-1927. … Cover design based on graphic by Fortunato Depero (1932)." "This CD is a 2006 co-production between LTM (Salon) and Radio Svizzera-Rete Due."